Join Joshua Chamberlain as he interviews the amazing roots reggae band this week on THE LISTENING PARTY #24. 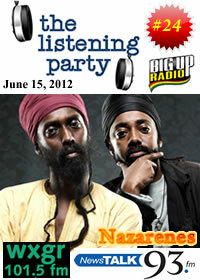 The Listening Party airs on Sundays on BigUpRadio's Dancehall station. Noah and Medhane Teowolde are two Ethiopoian brothers who formed the harmony group, Nazarenes, in the mid-90s after moving to Sweden. The Nazarenes broke out with a Heartbeat/Rounder release, called Songs Of Life in 2004, before teaming up with I Grade Records for their new album, Meditation (2012). The new album draws on the Tewolde brothers’ time growing up in East Africa and subsequent years spent as professional musicians in Europe as well as personal experiences with the Caribbean culture their music is based on. The Listening Party is presented by The 45 Shootout dot com. Join your host Joshua Chamberlain every Sunday on BigUpRadio.com for exclusive interviews with the best artists and producers in the reggae industry.